You are invited to be a permanent part of the longest-running Nutcracker in the Lehigh Valley! Our 50th Anniversary Performances in December 2018 will premiere New Costumes, Backdrop, and a spectacular new Mother Ginger! Donate for as little as $25 and have your name (or the name of someone you love) associated with this wonderful holiday tradition! 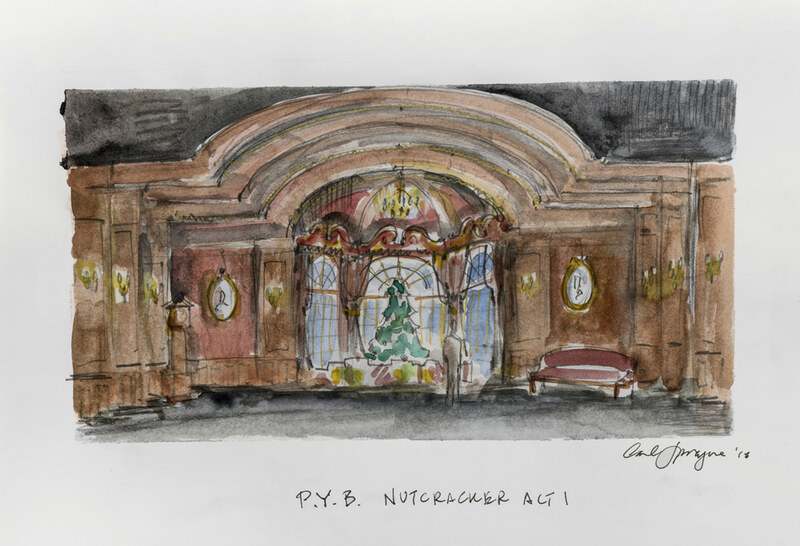 The Ballet Guild’s Nutcracker Act I Party Scene Backdrop is 50 Years Old! While it has served us well for these many years, it is now suffering from fraying, ripping, and mold. Help us refurbish the Stahlbaum’s Parlor, including some special “portraits” on the walls and fresh window coverings. This beautiful rendering represents our new Parlor Backdrop, which we can only fund with your help! The cost to produce is $24,000 and donations are accepted in any amount. Your name listed on the Donor Sign in the Zoellner Lobby for All Performances, and all benefits from previous levels!